Some people suggested that I might consider sharing a little history of a few of the campus buildings for those that are interesting. Well, it’s Friday evening, and I’ve already enjoyed a private 21st birthday celebration for a friend. So, why not? Rand Hall, built in 1912, was built in the industrial style typical for the time period. The building was donated by Mrs. Henry Lang in honor of her father Jasper Rand , and her ubcle and brother of the same surname. The building housed machines shops as part of the Sibley School of Engineering, and eventually was reworked to be the studio for many of the architect student as part of the AAP school. For those of us who aren’t architects, we rarely see the interior. We do, however, see the designs and phrases bored architects create on the compound windows. The building has been proposed for demolition in recent years to make room for proposed addition to the AAP school (see the Milstein Hall entry), but the current design proposal for Milstein Hall spares the structure for the current time. The building doesn’t tend to make much news, with the slight exception of a time a peacockfrom a Cayuga Heights home broke into their computer lab a couple of years ago . Lincoln Hall, across the path, has seen a much more varied history than its workhorse neighbor. Lincoln Hall was built in 1888 at the then-cost of $72,603, and housed the Civil Engineering until 1960 (it moved to Hollister Hall). The building was renovated for the music department, and they moved in the following year . Lincoln Hall saw an 18,640 sq. ft., $19 million dollar expansion from 1999-2000 (the addition is on the left side of the photo). The firm that designed the addition also designed Kroch Libe in 1992 and the Law School addition in 1988. Sibley Hall, namesake of Hiram Sibley, has three seperate wings built at three seperate times. The West Wing began construction in August 1870. 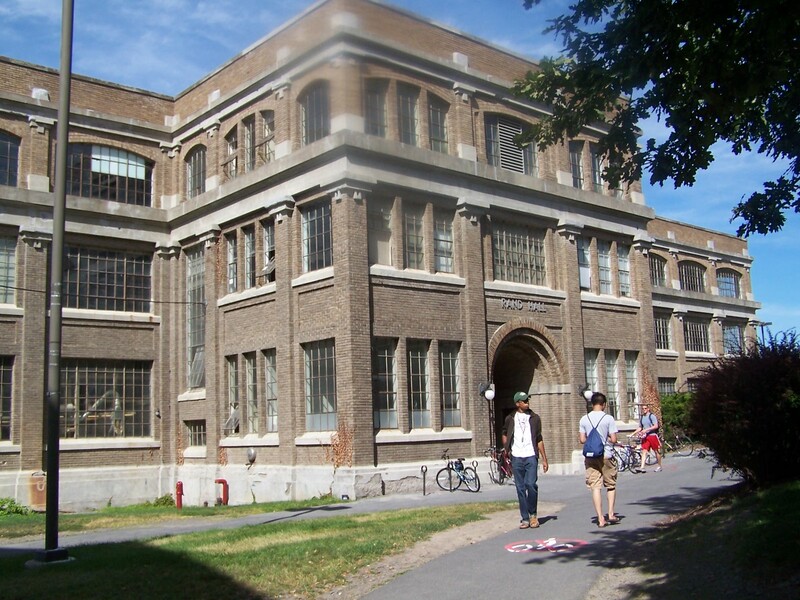 The building was dedicated to the “mechanical arts”, as so deemed by Hiram Sibley, an original trustee of the university. Sibley donated the money hinging on A.D. White building himself a president’s house on the campus . The east wing was built in 1894, and the center area, including the photogenic dome, was built in 1902. Although the three portions were designed by three different architects, they form a relatively cohesive single structure that serves as the nucleus of the AAP school. The center area houses the Fine Arts Library. The construction in the photo is some pipe work, and Sibley underwent minor renovations during the summer to make the building handicap-accessible, and to add more bathrooms to the structure. 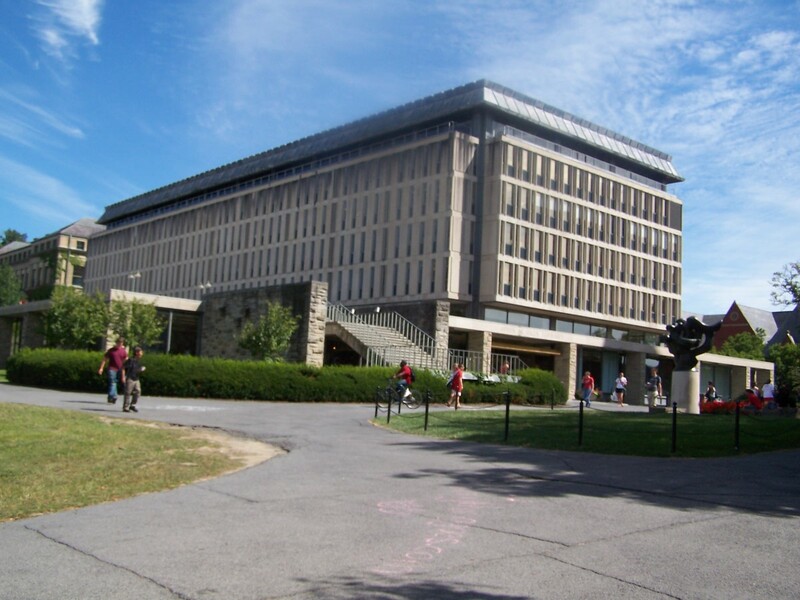 The John M. Olin Library shares the title of being the main library for the Cornell campus. The building was opened in 1961 . 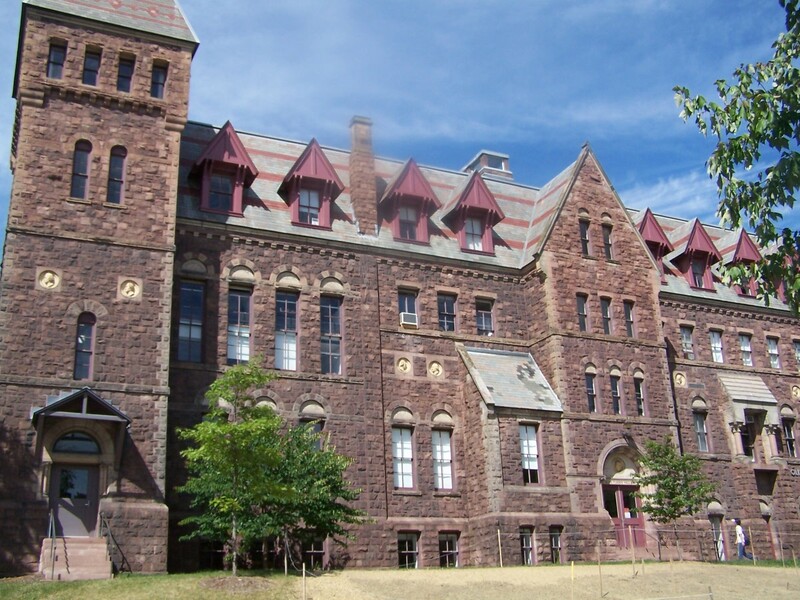 To facilitate its 5.66 million dollar construction, the university demolished Boardman Hall (1892), which was the original home of the law school. Boardman was a former dean of the law school. 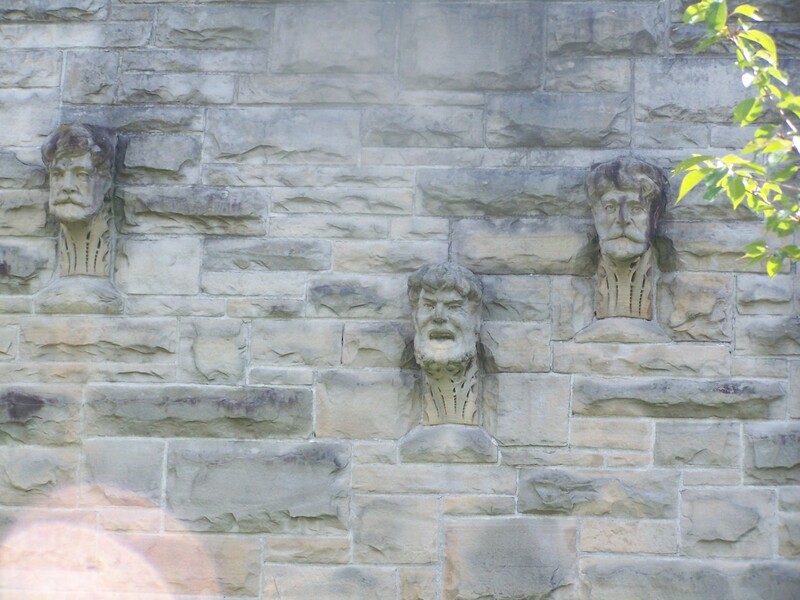 The three stone faces on the outside and the three stone faces next to the interior staircase are artifacts from the exterior of Boardman Hall that were incorporated into Olin’s facade. The Kroch Libary, largely underground except for four skylights next to Stimson Hall, was constructed in the fall of 1992 at a cost of $25 million dollars (namesake Carl Kroch ’35). For those who are curious, Olin has a utility tunnel to Uris, and Kroch has a utility stairway-tunnel that connects to Stimson, both of which are largely prohibited for non-staff use. Olin’s entry way and cafe were renovated in 2002. The rest of the building is currently being prepped for a major renovation that will clean the exterior facade and renovate the interior to being it up to safety codes and to make it more conducive for current trends in upper education (think “pollinization spaces” not too unlike those in Duffield and Weill, without the atrium). Tjaden was built as a “physical laboratory” in conjunction with West Sibley in 1883. Although $50,000 was budgeted, delays and material shortages drove the costs up to a final tally of $100,923, more than twice than was originally budgeted . This is partially because of A.D, White insistance on the use of stone, and the medallions that decorate the building with the profile of prominent men in the mechanical arts. If you look closely enough, you can see that the window arches still have the names of great discoverers and inventors inscribed into the stone. The building was originally named Franklin Hall, in honor of the great innovator Benjamin Franklin. The Department of Chemistry originally called the building home until it left for Morse Hall in 1890. The physics department left in 1906, and afterwards the building was incorporated into AAP as the Fine Arts building and workshops. 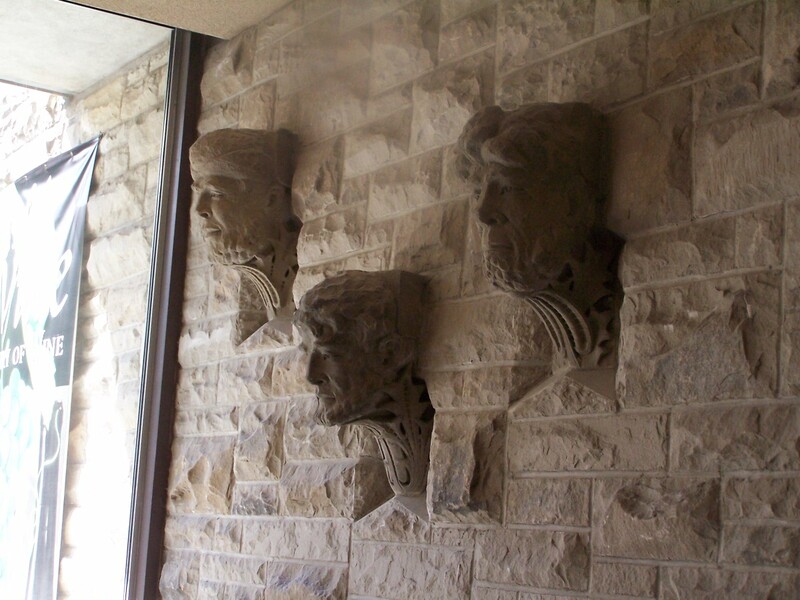 The building was rededicated in 1981 to Olive Tjaden van Sickle ’25, a pioneering woman architect . The building was renovated in 1998, at which time it regianed the hipped roof that I so inconveniently cropped off because I was too lazy to take a few steps back (the original hipped roof was deemed structurally unstable in the 1950s after a lightning strike set it on fire). Wait, we moved add/drop from 6:30 AM to 10 AM this year? Well, that takes the fun out of it. What’s more exciting than staying up all night (or in my case last year, trudging to Uris Libe at 6 AM) to try and get in the mad stampede to fix and fill schedules for the upcoming semester. The freshman need the shock and frustration of getting up early and still not being able to get a certain class, it would help them adjust better. I certainly don’t miss the wait and confusion of JTF; however, I can’t exactly say StudentCenter does a better job, because it takes forever to load a page, but at least tells you how many slots are still available in a class. 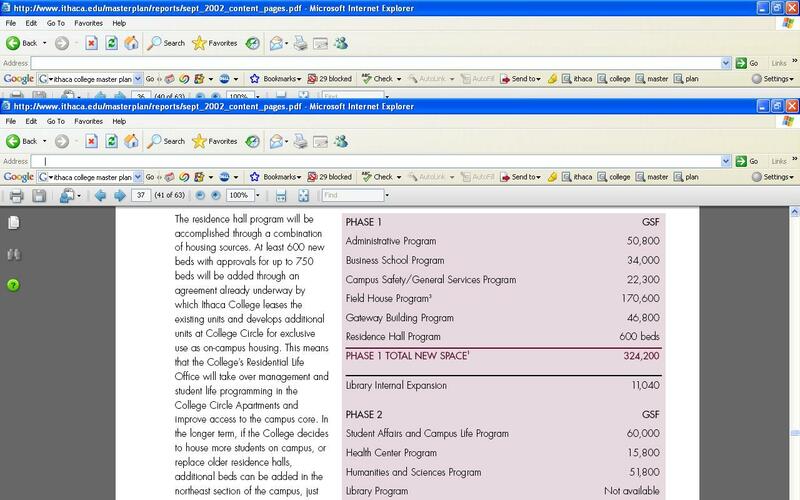 The convenience of this development is that some professors, normally those teaching smaller classes, never set a limit (technical limit is 9999), so you can plan your order of enrollment accordingly, trying to get into the classes with limited spaces first and the null limit classes at one’s own leisure. These details can be checked regardless of whether or not add/drop is underway, so my personal recommendation is to check and plan the “method of attack” before it opens at 10 AM tomorrow. All I have to do is switch out one class for another anyway. Are you serious? Jagat Sharma, the architect of the project, has made his name by designing the apartment towers in Collegetown and some of the luxurious lakeside mansions in the Ithaca area. And Delta Chi hired his firm to design…a gravel parking lot expansion? I mean, couldn’t you get a standard construction company to just tear a base into the ground and lay the gravel without paying all the extra money for a bigger-name architectural firm to design it? If Delta Chi were building an addition, I could understand, but a gravel parking lot? Talk about money to burn. I was wondering why there were construction permit signs going up over there with Sharma’s name listed as the architect. I honestly thought at first they were building a gatehouse or something. The other items for the meeting are nothing special; a house, roofwork on Eddygate, and a subdivision. EDIT 8/27: It’s a news tidbit, so I though I ‘d throw it in here. It’a a sun article talking about how Cornell gets bashed and we should give our detractors a f*ck off farewell. While I agree with the article’s sentiment wholeheartedly, I should point out one little fallacy- those pins with the “I’m the Hottest” crap were free. We gave them out as a promo to get you to buy random crap, and we still have a sh*t ton of them somewhere in our warehouse across town. I’m taking it easy with this post, since I was directing cars on the Balch Lawn for a large portion of the day (welcome freshmen, to what could be the best four years of your life!). Occasionally in the search bar, someone types in a question. Let’s take a look at what people want to know. Ans: To my knowledge, this has not happened in recent history. Ans: If they were secrets, chances are that information isn’t going to be readily accessible, so how it would even be on the internet or in libe documents is beyond me. Many fraternities operate with some clandestine functions, but in my experience, it’s less in terms of cloak-and-dagger and more because it makes pledging and private functions all the more interesting. Case in point, the fraternity of Phi Kappa Psi advertises secrets concerning spatial geometry on its website . Ans: Well, Bistro Fry in Collegetwon has been replaced with Jack’s Collegetown Grill. And a couple buildings down from the State Street Diner is a new restaurant called “Fine Line Bistro”. TBP opens up a new location on the Commons next month, and a second restaurant will be moving into what used to be the used bookstore on the Commons. Olivia’s has also permanently closed. Fair enough? Also, not in any recent history. What is up with people thinking so many fraternities have been kicked off campus? Yes, this was an actual question. However, I don’t feel I can provide an adequate answer. This isn’t because I haven’t enjoyed my time here; I’ve found Cornell to be a rewarding and stimulating experience, if a little academically frustrating at times. But everyone has their own reasons for loving Cornell. And unless I could somehow compile all the answer together in one long list, than I really can’t provide a full answer to that question. We all have our own reasons for loving the institution that is Cornell. Haven’t heard anything about it. Registration is linked from the OFSA (Office of Fraternity and Sorority Affairs) website. Traditionally, fewer fraternities participate in the fall rush, which is primarily transfer students along with a few curious upperclassmen. However, the fall rush has been decsribed as more intimate by some of its proponents, in the sense that you get to know rushees better. I’m sure if you send an e-mail to the OFSA or IFC folks, they’ll be able to fill you in on which houses are doing rush and any other details you should know. Oh, and there might be a promotional pamphlet going out for fall rush at some time soon. Well, yes, yes it is. Originally built in 1924 as a combination of faculty and graduate housing, Anna Comstock Hall was programmed as the Latino Living Center in the fall of 1994. This was after a peaceful occupation of Day Hall from November 19-22, 1993, where several events that strongly concerned members of the school’s Hispanic population caused them to stage a demonstration and a sit-in on the building to voice their concerns . Day Hall is a frequent target for occupation anyway (do a google search on Redbud Woods for another example). Really? There must not be a whole lot of it. If anything, it’s because Cornell’s larger and in the Ivy League, so they tend to steal attention away from IC. But as for tension, there’s not much from what I’ve heard. But we also don’t mingle too often, with the exception for some muscial and theater groups, and Cornell staffers with ICTV. For the last time, NO. Casca was built for the original purpose of a water sanitarium, but never even functioned as such. Old Ezra was a major investor who took the building for his own uses when it appeared the sanitarium project would never get off the ground. That was back in 1866. Dunno what that must be like. A little loud at times, I would guess. Anyone care to give a more accurate description from their own experience? 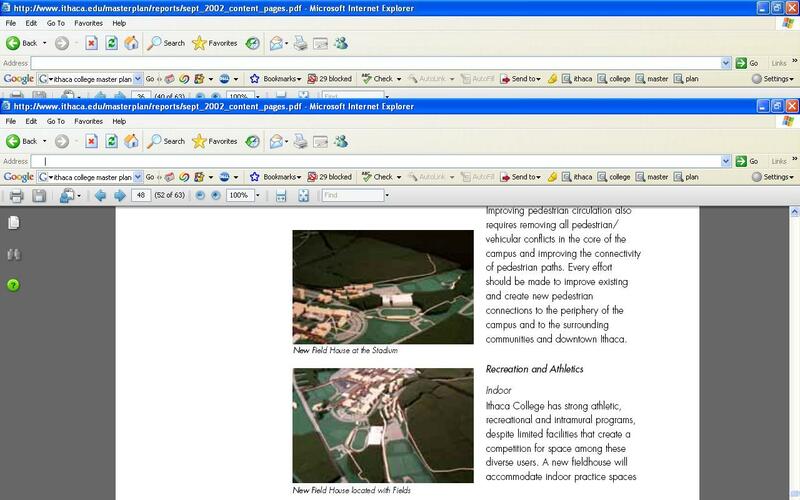 So, I know recently I devoted five entries and several hours of my life to coverage of the Cornell Master Plan. But, while I back the Big Red in the spotlight, it wouldn’t be fair if I didn’t give a little attention to the neighbors on South Hill. 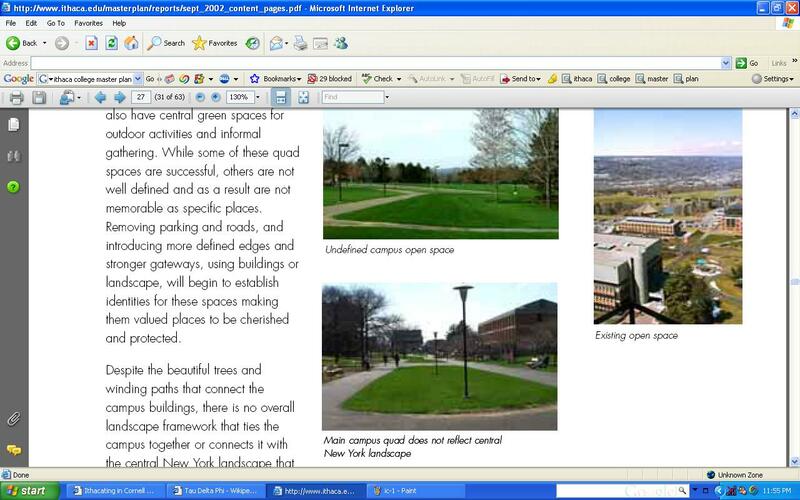 Ithaca College has also completed a master plan, created by Sasaki Associates and finalized in September 2002 . The plan is available for perusing online, but it comes in a rather crappy resolution pdf that makes it almost impossible to pick out some of the finer features. But, let’s give it a try anyway. Note one thing as we glance through this: The Park Business School (architect Rober A.M. Stern) , the Gateway Center (HOLT architects), and the new Athletic Center have been recently built or are currently underway in some stage of approval or construction. 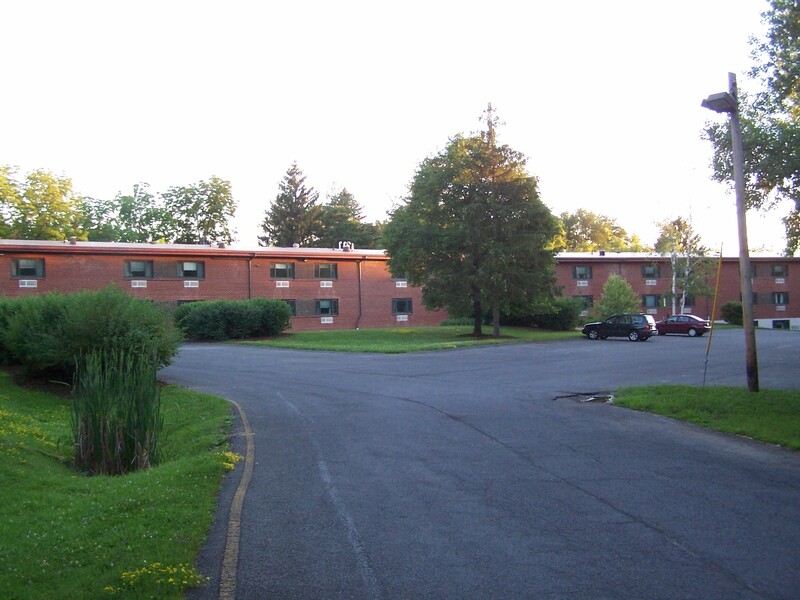 So, a brief history on the physical plant of Ithaca College; the first five dorms and the student union were built in 1961 (previously, the college occupied rented spaces in downtown Ithaca; classes were taught in the dorms and union from 1961-63). The first academic building, Friends Hall (it was paid for by the organization Friends of Ithaca College), was built in 1963. Five more residence halls and a health center were completed by the end of the year. A little side note; for those unaware of the living arrangements of Ithaca College, it is an all-residential college, meaning that with the exception of seniors who choose to do so, all housing is on-campus. 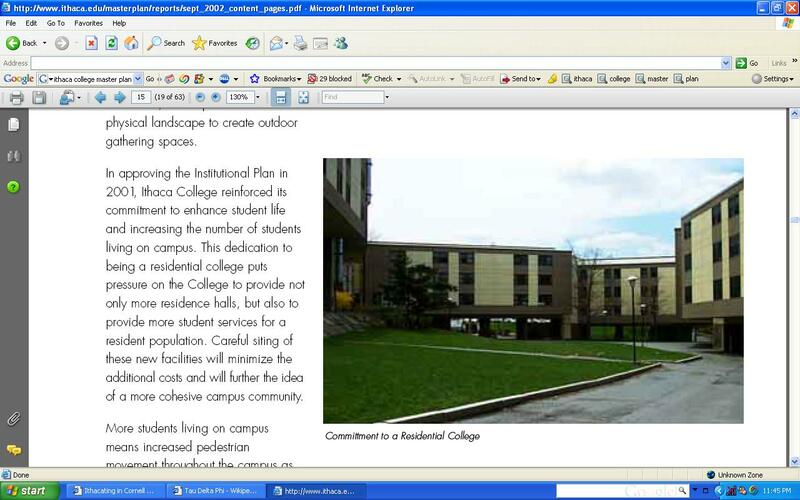 So they have more dorms than we at Cornell would be likely to suspect. 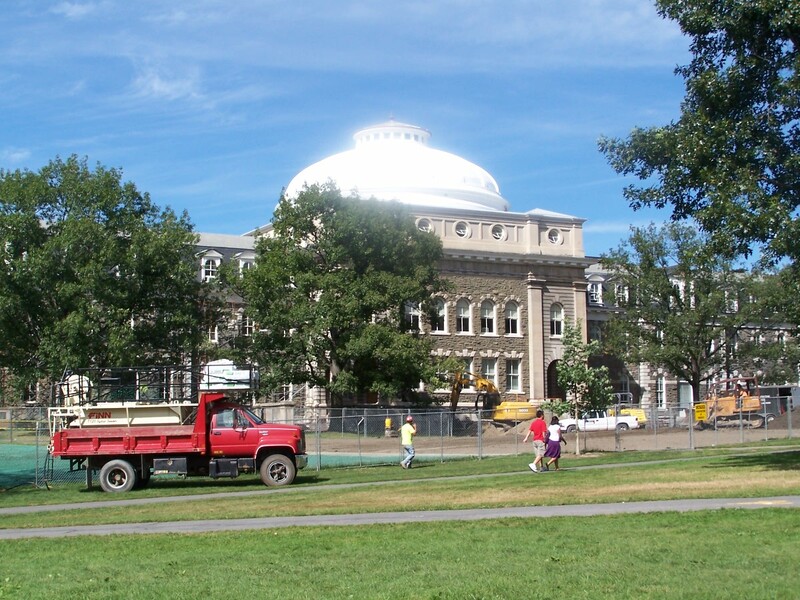 The campus expanded rapidly in the late 1960s, but saw very little construction in the 1970s, with the exception of a few smaller projects at the beginning of the decade and the end of the decade. 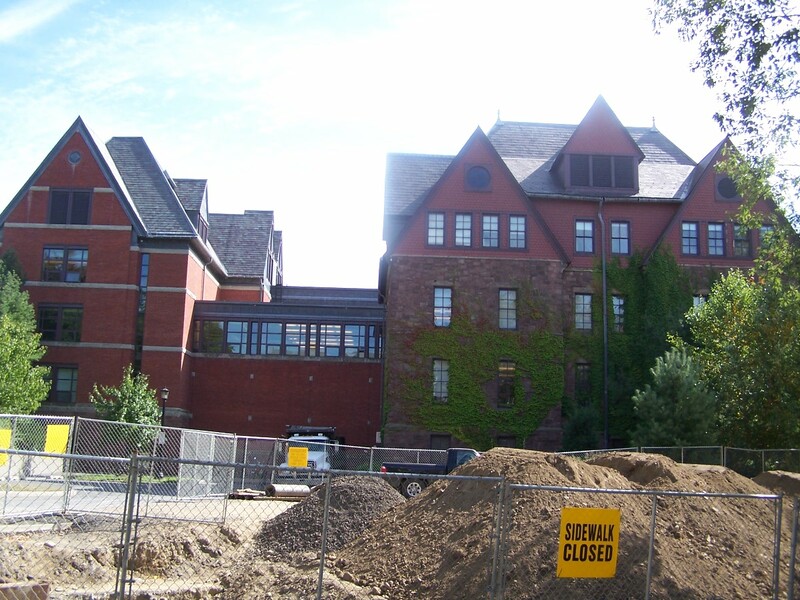 The next wave of construction began with Smiddy Hall, which was completed in 1981. Ithaca College tends to play favorites with architects; Tallman & Tallman designed their first twenty or so buildings up to 1971, and then with a few exceptions, HOLT architects has designed most of the rest since the mid-1980s. Go on and tell me the sixties weren’t a bad decade for architectural design. I’m all ears for any justification. The master plan identifies the need for about 170,000 sq. ft of office space immediately, and another 200 parking spaces. It also says that despite the stunning local topography, that the campus’s open spaces fail to utilize the area properly and are unmemorable as a result. 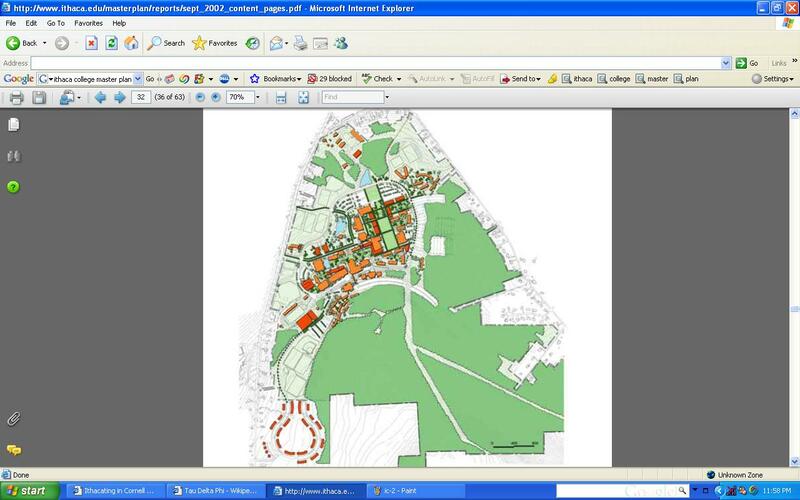 In the Ithaca College master plan, new development is identified in a darker shade of orange, as compared to the lighter shade used to denote existing buildings in 2002. One of the goals of the plan is to have everything on central campus within a 10-minte walk from any given location. 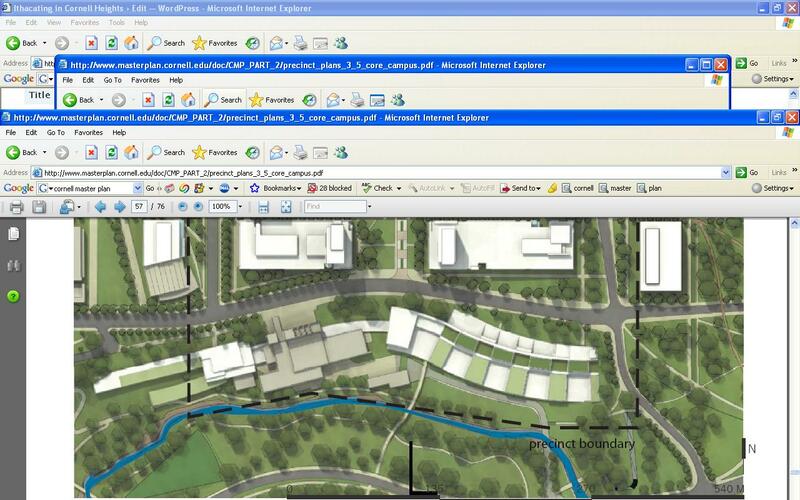 As a result of this pursued ideal, the central campus is much denser. The total academic/office space to be built is around 500,000 square feet, with an additional 380,000 sqaure feet of additional dorm space. The central campus also features a “main street” connecting many of the important area of the campus. So, it’s towards the Cornell-far-side, but I still think that due to its massive size, Collegetown residents will still be able to pick it out on the southern skyline. So while we have our plans going to work, IC’s already implemented theirs and has been trying to meet their goals for a little while now. Here’s hoping that the plan is as successful as they hope it will be. P.S. I wanted to write about the IJ article extending the Collegetown moratorium and limiting building heights even further in Collegetown (on the five or six parcels that would’ve actually been raised), but I’ve just decided that councilwoman Mary Tomlan isn’t worth the time and effort of deriding her as a backwards-thinking malcontent. 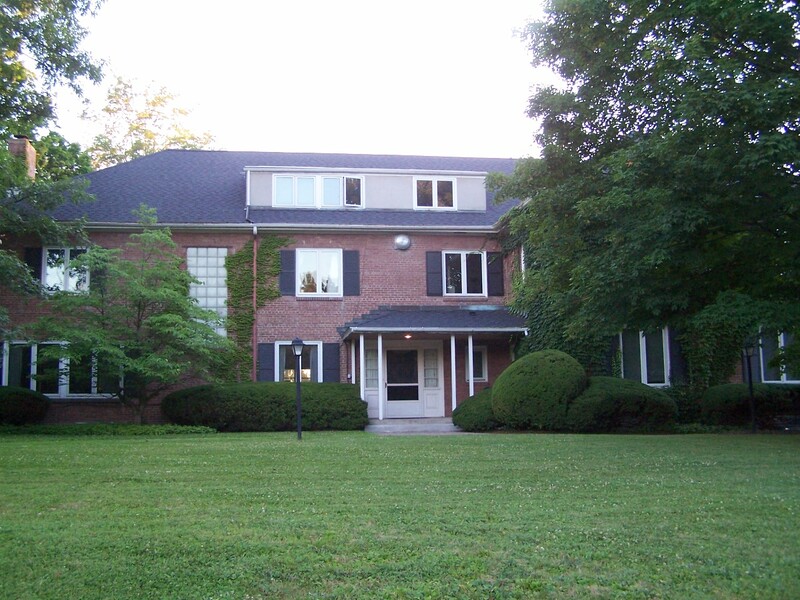 This is the house of the sorority Pi Beta Phi, which is kinda far out on Triphammer Road. Pi Beta Phi started out as a local chapter called Beta Phi. 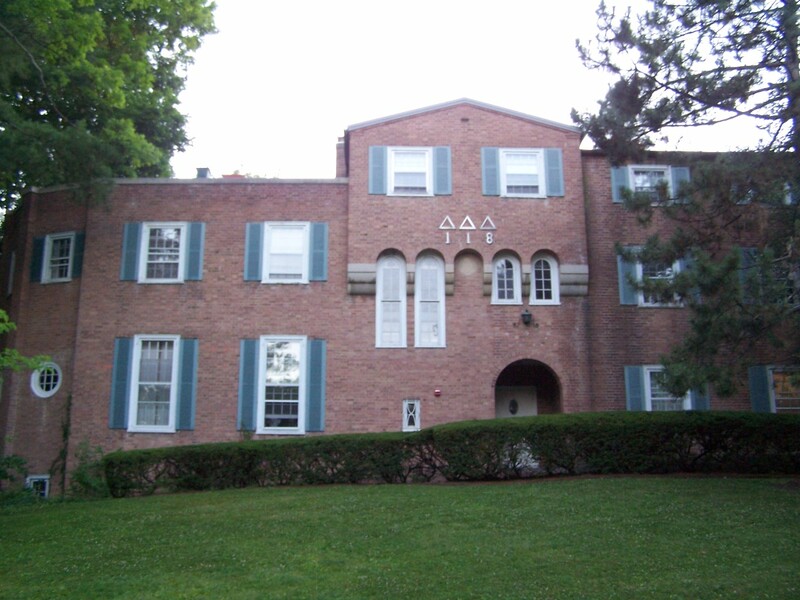 By 1919, they had become the NY Delta chapter of Pi Beta Phi sorority, and they first met in Risley Hall, which was at the time an all-women’s dormitory. After moving around from Eddy Street and Wait Avenue, they settled at 425 Wyckoff Avenue in 1937. By 1955, they has sold this house to Alpha Chi Sigma, and they built the current house in 1955-56 . At least one sorority has made it easy for me to dig up some historical information about them. Token sculpture? Perhaps, but I’ll provide a little detail about it anyway. 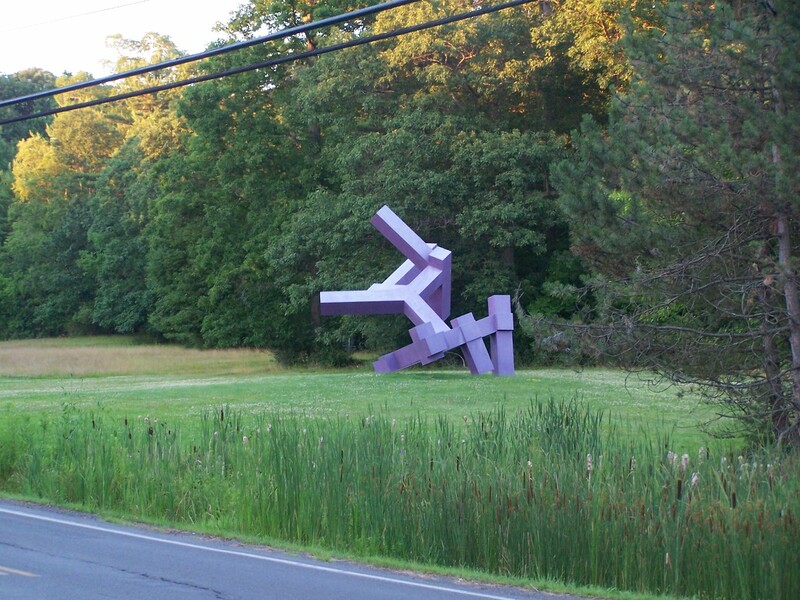 The sculpture is called “Richard Evans, 2nd, III”, and was created by Daniel Ben-Shmuel Barrett. It used to be located next to the art museum as part of an abstract art exhibit, but because they needed the space, it was moved to north campus in 2004 . There are also sculptures next to Appel and near Akwewon. Hurlburt House, or as it is more commonly known, EcoHouse. The building was originally constructed as a motel/travel lodge in 1953. Shortly afterwards (~1963) it was purchased by Cornell and renamed the Cornell Heights Residential Club. The building was used for graduate housing and for housing for students of an experimental accelerated PhD program . On April 5, 1967, a devastating fire tore through one of the wings of the residence, killing eight students and a live-in faculty member . Firemen said three bodies were found in the entrance lobby, one on the stairs between the first and second floors, one in a first floor room, and four in rooms on the second floor . An investigation afterwards stated that inadequate fire safety (lack of fire escapes and alarms) combined with deadly toxic fumes released by the burning rubber-plastic furniture were the primarily factors in the devastating tragedy. In case you’re wondering, the PhD program was discontinued. As for the building, the wing where the fire took place was torn down, but several residents and visitors claim that the basement of the wing (which still exists) is haunted . Haunted in this case means screaming, an oppressive heat, strange lights and the barking of a dog that dies in the fire. I’m going to stay skeptical on this one, and say it’s probably just some overactive imaginations. I’ve been inside only a couple of times, but I found the accomondations seemed luxurious compared to other dorms, and they were tightly-knit group. This building is home to the Triphammer Co-Op. Built in 1912, the house originally housed a sorority known as Sigma Kappa. Around 1955, the sorority admitted an African-American woman, which was against their national’s rules and regulations (remember, this was at the beginning of the Civil Rights Era). The national ordered the women to get rid of her or risk being booted out of Sigma Kappa. 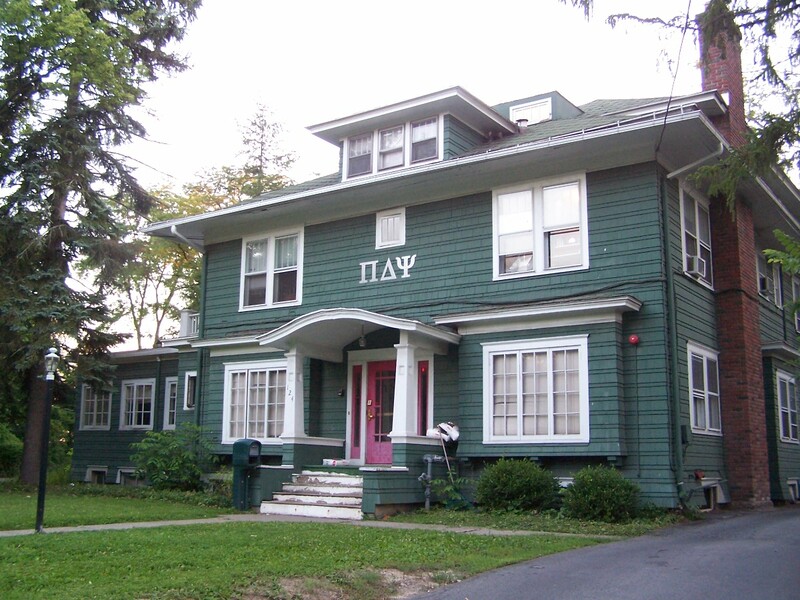 Well, the Cornell chapter flipped their national the proverbial bird and became a ladies co-op. The co-op went co-ed in the early 1990s, and today houses 19 men and women in eleven singles and four doubles . The co-op’s southern neighbor is the MGLC fraternity Pi Delta Psi (is this the only MGLC organization that maintains an official house right now?). 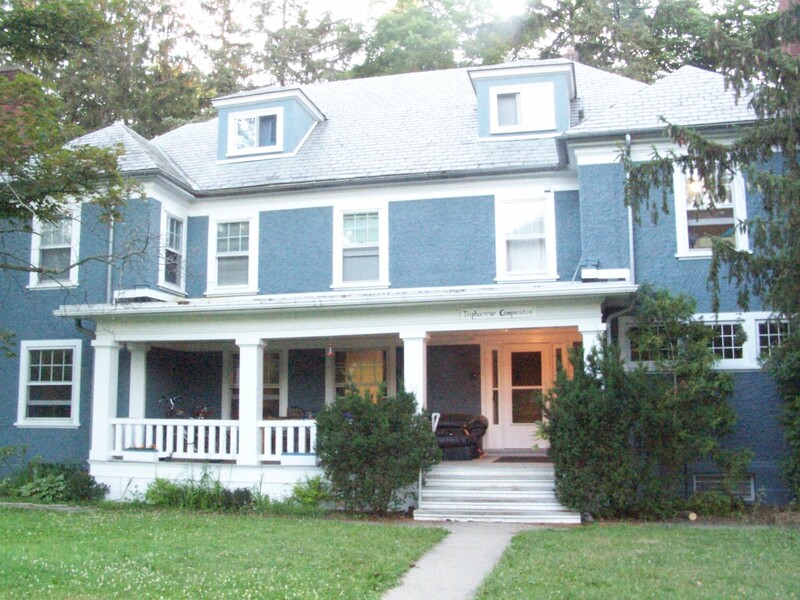 The house itself dates from about 1915, but the house only came into the poession of the fraternity a few years ago, in 2003. Pi Delta Psi is an Asian-interest fraternity . The house of Delta Delta Delta sorority, more commonly known as Tri-Delt. 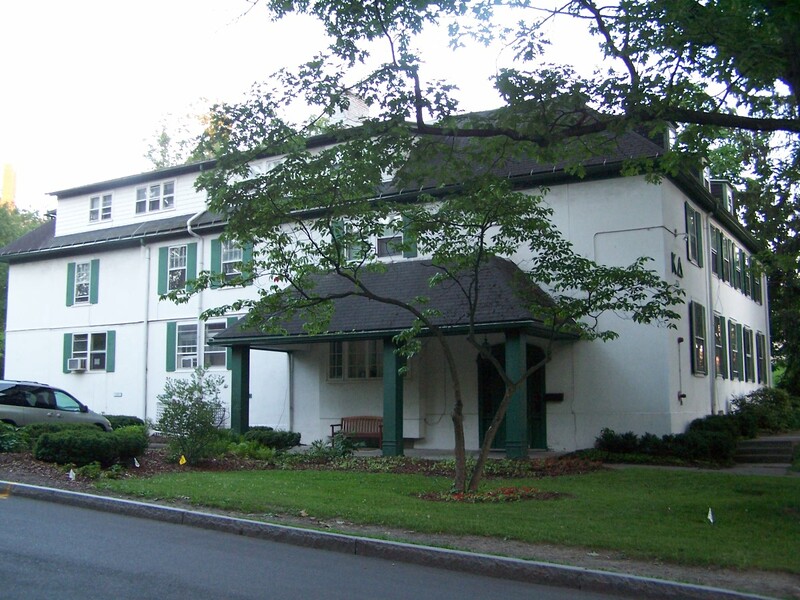 The Alpha Beta chapter here at Cornell began as the woman’s club “Sennightly” in 1895, taking their name from the fact that they held a meeting every seven days (heck, my fraternity barely manages to hold a meeting every two weeks without someone b*tching). The women petitioned a national sorority so they could stay in touch in later years as well as perpetuate their organization. By 1912 (yeah, missed the boat on that one), Tri-Delt national took interest, watched them as they threw a party, liked what they saw, and offered them a seat with their sorority. From 1912-1965, the house was on the 600 block of Thurston, in what is now the Alumni House; afterwards, they moved to this house on Triphammer with its Moorish influence . 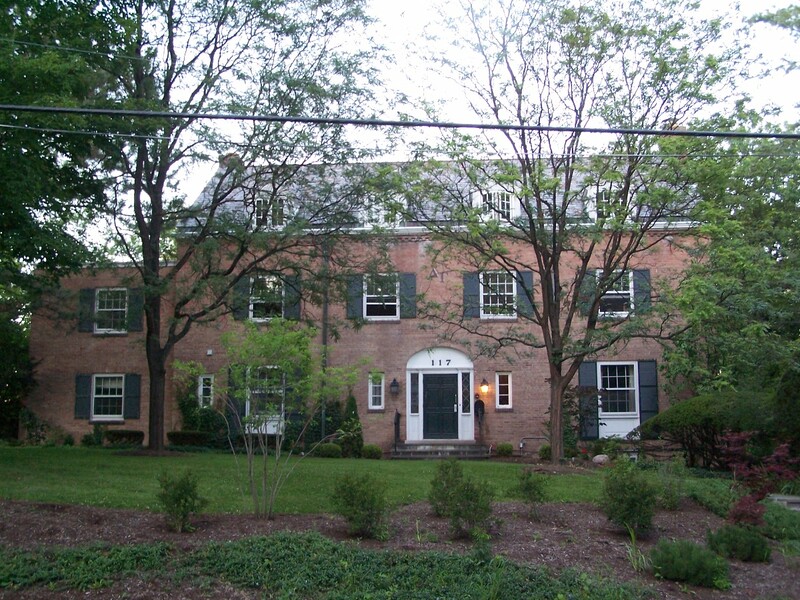 The moorish house was home to Kappa Alpha Theta prior to their national disaffiliating them in 1965. So, I’m writing this as I’m sitting at a desk within the hotel; granted, I’m on the job, but it would help if I had more than one customer every forty-five minutes. It’s a bit of a running joke among Cornell Store employees that the Statler requires a dress shirt, tie and a really long book. Luckily, one of the few benefits to working the Statler Hotel gift shop over the main store is that we actually are permitted to browse the internet (with discretion). Consideration of a sketch plan for the proposed Cornell University Energy Recovery Linac (ERL) project located north of the Pine Tree Road and Dryden Road (NYS Route 366) intersection, Town of Ithaca Tax Parcel No.’s 63-1-8.2, 63-1-2.2, 63-1-12, 63-1-3.1 and 63-1-3.3, Low Density Residential Zone. The proposal involves construction of an underground accelerator tunnel (14-foot diameter and 2 km long), a cryogenic facility and associated electric substation (+/- 15,000 square foot footprint), and an extension to the existing Wilson Laboratory (+/- 185,000 gross square feet of building space). The project will also involve new stormwater facilities, parking, outdoor lighting, and landscaping. 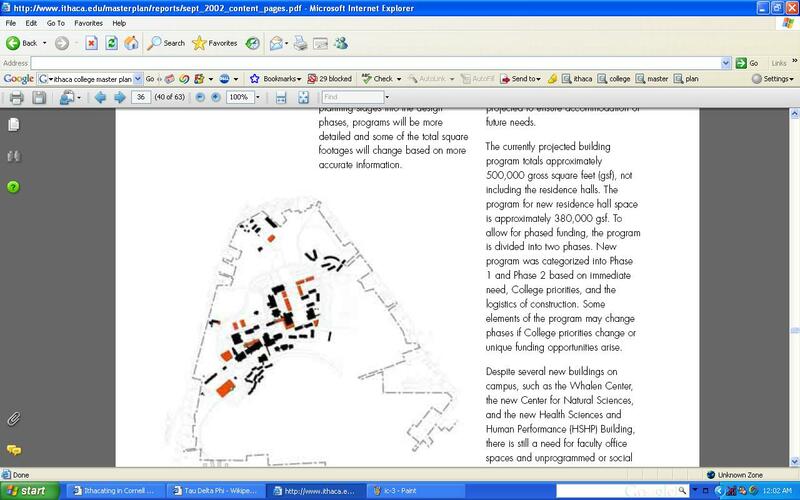 Cornell University, Owner; Steve Beyers, P.E., Engineering Services Leader, Agent. The other agenda items aren’t notable (a radio tower, continued discussion about the IC Athletic Complex, and the continued use of an equestrian facility). So, the construction of 200,000 sq. ft of physical plant, a cryogenic facility and an accelerator tunnel require a bit of investigation. The first thing I came across is this week-old Cornell Chronicle item. 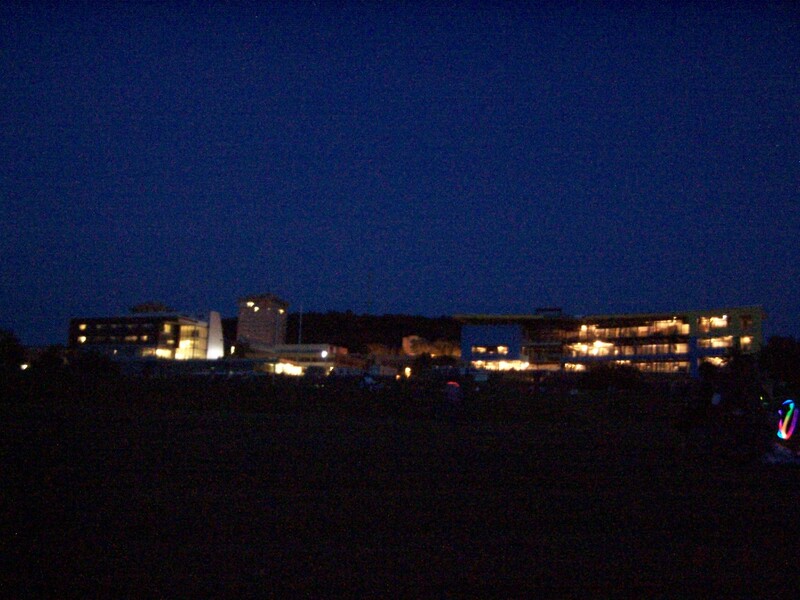 The particle accelerator has a planned timeframe of construction that would allow for the beginning of operations in 2011 . Rather than try and explain the operations of the particle accelerator itself, I’m just going to quote the article (I’m excusing myself on the grounds that I study thermodynamics, not quantum physics). “The ERL would accelerate electrons to nearly the speed of light in a linear accelerator (linac) made of two straight tubes, each about 330 meters (0.2 miles) long, then feed them into the Cornell Electron Storage Ring, Hoffstaetter said. After a single rotation around the ring, the electrons would return to the linac, where their energy would be recovered and used to accelerate the next batch of electrons. So, our physical plant will continue to expand for some time yet.